Historically, one of the most disappointing things about licensed games (those based on pre-existing characters) is how thin the gameplay was. Few such games deserved to be played more than a handful of times. But that's changing. For example, Star Wars: The Queen's Gambit won praise from gamers, as did the Buffy the Vampire Slayer game. In the realm of children's games, The Powerpuff Girls Game: Saving the World Before Bedtime from Milton Bradley deserves some kind words, as does the game. Designed for 2 to 4 players, ages 8 and up, The Powerpuff Girls Game mixes both strategic (long-term) and tactical (short-term) choices with enough luck to give even weaker players a chance to win every now and then. That last element is a vital consideration for some parents. The oversized game board (30 inches wide, 20 inches deep) depicts Townsville, the Girls' hometown, including the Mayor's Office, Pokey Oaks School, the Toy Store, and Mojo Jojo's Hideout. A set of 31 tiles are distributed to each of the spaces on the board, face down. 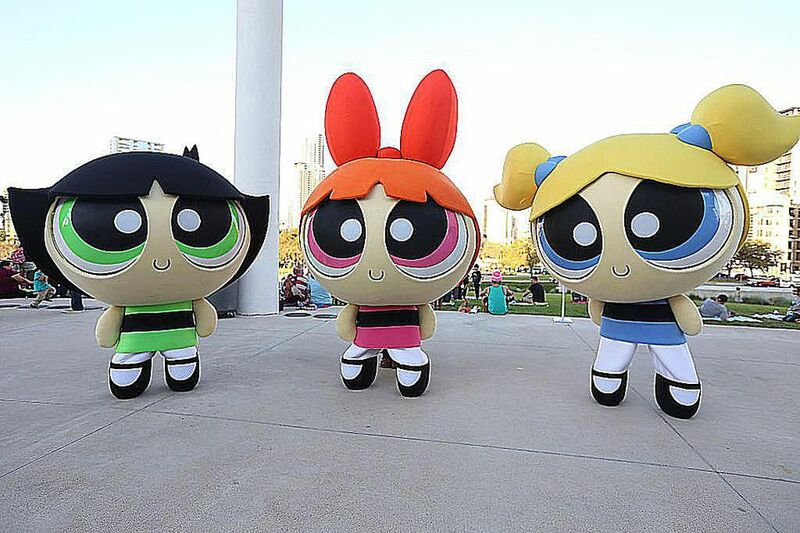 The Girls -- Blossom, Buttercup and Bubbles -- begin the game at home. Each player is dealt five cards from the 54-card deck, and chooses two to play face down. The played cards are revealed simultaneously and are resolved in order of the time on the cards. For example, if one player plays the "1:50 p.m. Move Bubbles 1 or 2 Spaces" card and another plays the "4:00 p.m. Move all the Powerpuff Girls to the Park or the Bank" card, the 1:50 p.m. card is used first. When a Powerpuff Girl is moved to a space, she must deal with the tile located there (if one remains). The tiles come in three varieties -- villains, traps, and Professor Utonium. A Professor tile, saved by the player who reveals it, allows players to re-roll all of their battle dice in a fight with a villain. A trap knocks out all of the Powerpuff Girls located on that space for the rest of the round, but is then removed from play. When one or more Powerpuff Girls (any player can move any Powerpuff Girl) land on a space with a villain tile, a battle takes place. The player who moved the Powerpuff Girl to that space rolls one die per Powerpuff Girl. If you get enough hearts to conquer the villain (usually one, but some tough villains like Mojo Jojo require two), you win and collect that tile. The first player to collect four villain tiles is the winner. The Powerpuff Girls Game: Saving the World Before Bedtime can be enjoyed by children and adults, a clear step up from some licensed games in years gone by. But it's not entirely flawless. For example, some of the rules could be more clear. What happens if two Powerpuff Girls attack a villain (so two dice are rolled) and one die shows enough hearts to win the battle, while the other shows a "V" (meaning the villain wins and knocks out all of the Powerpuff Girls on that square)? The rules are silent, but my recommendation is to let the Powerpuff Girls win, since that will move the game along a little faster. Still, any criticisms are truly minor. The gameplay is solid, the components are sturdy and players are required to make intelligent choices. If your children are fans of The Powerpuff Girls, this game can be recommended without hesitation. Is There a Board Game of Plants vs. Zombies? What Is Different About Designer Games, German Games or Euro-games?